In 1947, Jackie Robinson engineered the integration of professional sports in America by breaking the color barrier in baseball. He overcame numerous obstacles in his 10 year career to become one of baseball’s most exciting and dazzling players. His enormous talent helped lead the Brooklyn Dodgers to six pennants and one World Series Championship. The ultimate honor was bestowed when Jackie was inducted into the National Baseball Hall of Fame in 1962, his first year of eligibility. 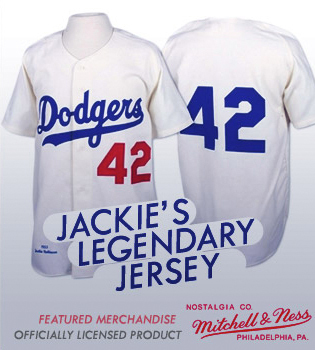 However, Jackie Robinson’s contributions go far beyond the baseball diamond. Upon retirement from baseball, Jackie fought tirelessly to improve the quality of life not only for African-Americans, but for society as a whole. By becoming the first black vice president of a major American corporation, Robinson continued to open doors for African Americans. Attended Washington Junior High School in 1935. Achieved four-letterman status at John Muir Technical High School. Enrolled in Pasadena Junior College 1938-1939. Led Pasadena to the Junior College Championship in 1938. Named Most Valuable Junior College Player in Southern California in 1938. Held the National Junior College broad jump record. Won the NCAA broad jump title at 25′ 6 1/2″. Became UCLA’s first four-letter man. Served in the U.S. Army from 1942-1945, during which he became second Lieutenant. Inducted into UCLA’s Hall of Fame on June 10, 1984. Broke the color barrier in major league baseball in 1947 by becoming the first African-American player. Led the Dodgers to six World Series and one World Series Championship in a 10-year span.